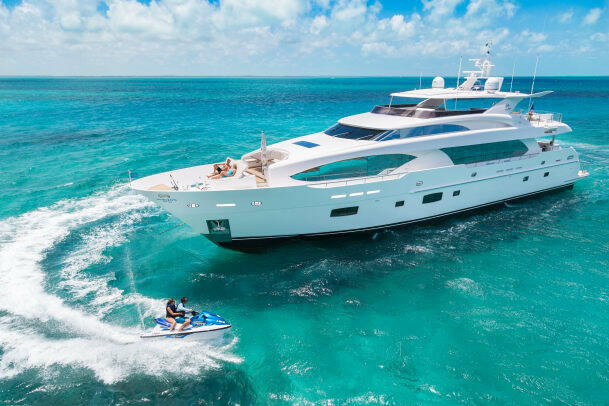 With its Raised Pilothouse 120, Horizon focused on everything that matters. 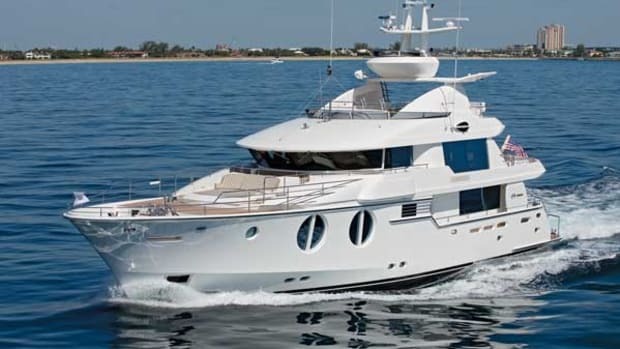 Every yacht review seems to start by oohing about the stylish lines or aahing about the salon or going gaga about the master suite. 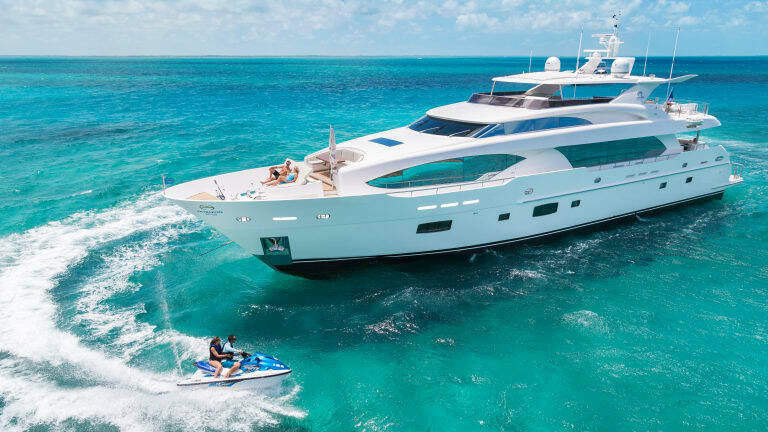 I’m starting this review of the Horizon Raised Pilothouse 120 in a different place: the crew quarters. And then I’m going to talk about the tender garage. Why? 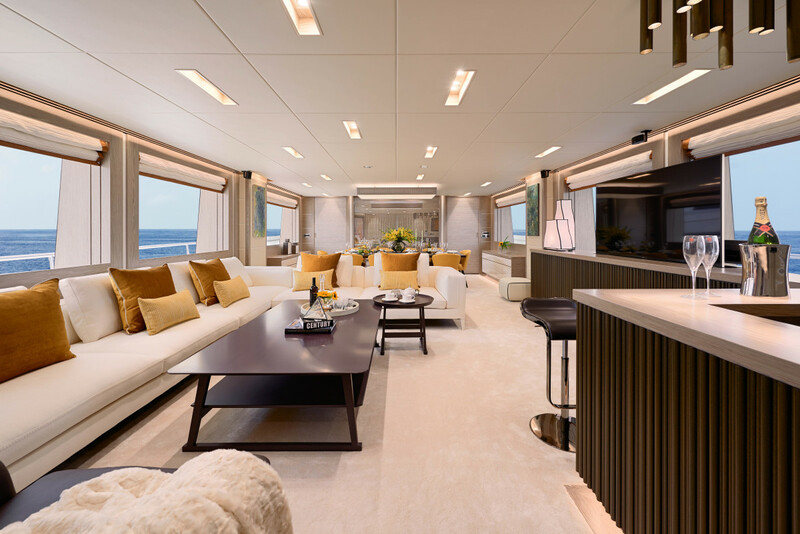 Because those two spaces—which on some yachts can be reminiscent of third-world prison cells—are finely finished aboard the Horizon RP120, showing that the builder’s attention to detail goes far beyond the spaces that usually get noticed. The crew quarters are satin-finished in warm teak, with three cabins for a crew of six. The captain gets a double with an ensuite head and stall shower, while the other two cabins have crossed berths and share a head with shower. The crew area also has a mini-galley (with cooktop and stand-up fridge) and a table with settee that seats six. 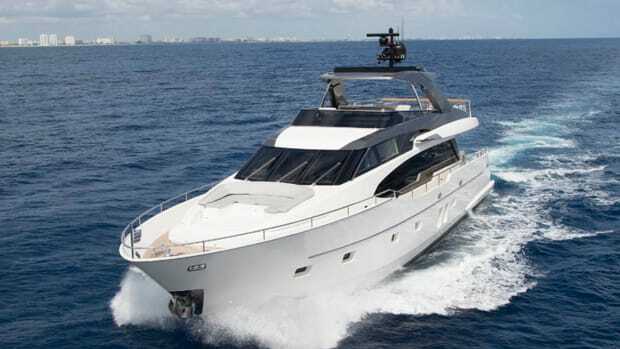 Access is through stairs from a side deck door while underway, or via the transom at rest. Given the way these quarters compare to some others I’ve seen, owners should expect a waiting list of crew wanting to work from these digs. Just outside the crew quarters is the tender garage, also impeccably finished. It serves as a teak beach for owners and guests. A stainless steel counter doubles as a buffet or, when needed, a workbench. A day head is tucked in one corner so guests needn’t track through the yacht in wet bathing suits. The tender garage doubles as a teak beach for owners and guests, with a buffet and a day head. 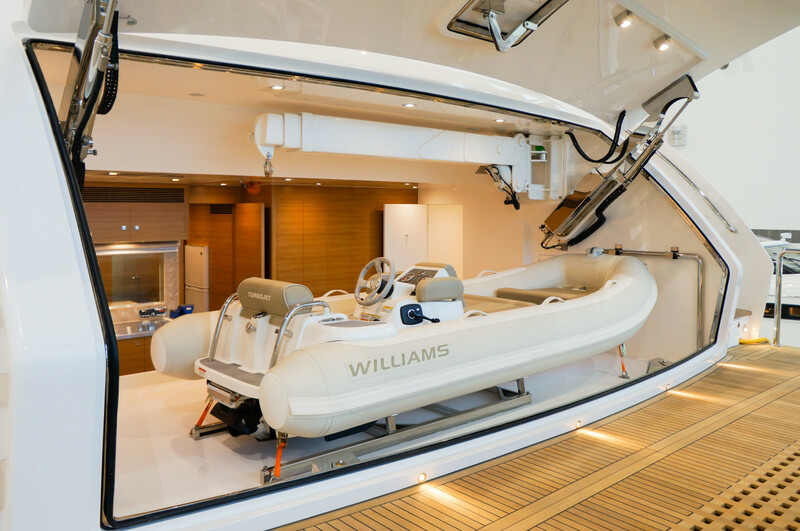 The tender on our test RP120 was a 14-foot-10-inch (4.45-meter) Williams Turbojet 445, which still left a lot of room in the garage. A crane in the garage launches and retrieves the tender, and the transom platform lowers hydraulically. Only the center section of the platform submerges, leaving two “pontoons” extending on each side to ease tender handling. As for the parts of the yacht that typically get more attention, the salon is pretty swell, too. Luca Dini Design in Florence, Italy, called the shots on the décor, drawing on pale “breeze oak” for a whitewashed look. A piping texture on the cabinetry ties the décor together throughout the yacht. 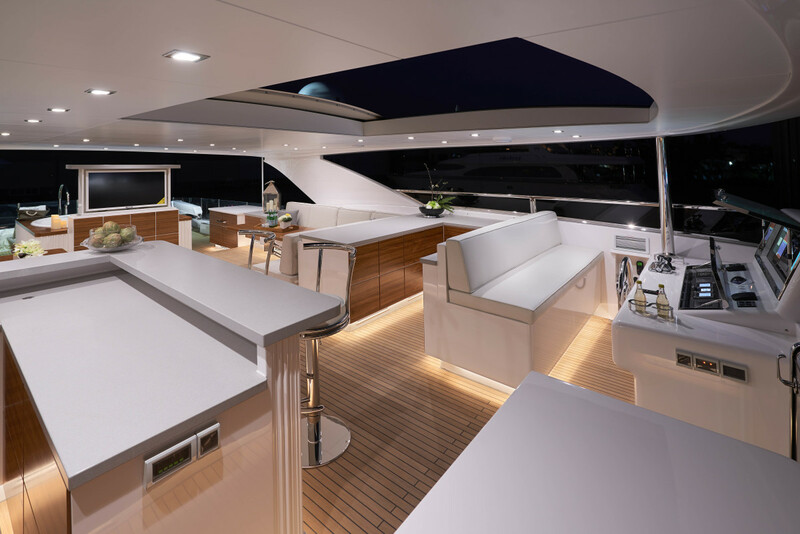 Stepping into the salon from the aft deck, there’s a sunken bar to starboard with movable stools for guests at the counter. In the port corner of the salon is a day head. In addition to sweeping views courtesy of large horizontal windows, the salon presents the best of Luca Dini, with décor drawing on pale ‘breeze oak’ for a timeless whitewashed look. Horizon will rearrange the salon at an owner’s request; aboard this RP120, an L-shaped couch gives guests a panoramic view when seated. The space becomes a media room with the Roman blinds lowered and the pop-up TV popped. The forward third of this RP120’s salon is devoted to dining for 10, with buffets on each side. Luca Dini Design placed a wood-slatted mirror on the forward bulkhead that gives the hint of a longer salon. The galley to port runs fore and aft with an electric pocket door to keep guests from seeing the chef at work. Inside are dual Sub-Zero fridges, an extra freezer and stowage. The galley has a pantograph door to the side deck, so the crew can load provisions without tramping through the salon past the guests. The master’s windows are designed to complement the lowered bulwarks on deck, creating an unobstructed view. Down three steps forward is the master bathroom with twin vessel sinks, veined pale green marble (on this 120) and a tub and shower. His-and-her closets bookend the area. 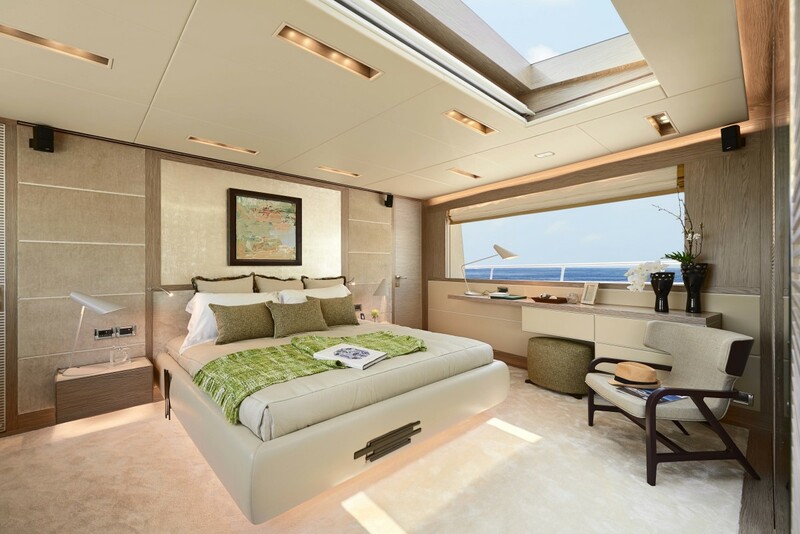 The full-beam master stateroom is located on the main deck, which allows for a skylight, making the room even brighter. The lower deck has democratic accommodations, with two matching VIPs abaft the foyer and two ensuite guest staterooms forward with twin berths. Up in the pilothouse are settees and tables for guests to watch the action. Next to the helm chair is a table for those ancient nav tools called charts. 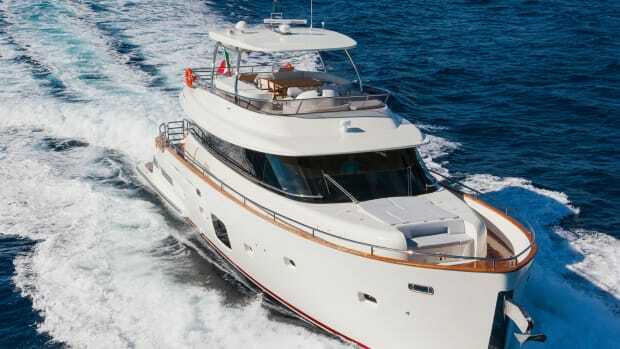 A few steps up from the pilothouse is the flybridge, with more than half covered by a hardtop with built-in sunroof. 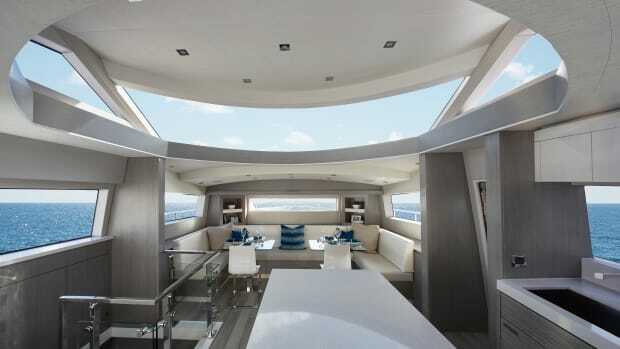 An upper helm is tucked to port, and the rest of the bridge is given over to pure hedonism. An L-shaped bar is to starboard, and a buffet area for munchies is to port. Two L-shaped settees are on each side with tables, and a hot tub is on centerline just past the sunroof, so guests can admire the stars from the bubbles. A pop-up TV faces the sitting areas, and because it is a waterproof SunBrite, it can swivel toward the hot tub. For barbecues, a grill emerges from a console, and for breezy days, clear acrylic windscreens protect the lounge area. 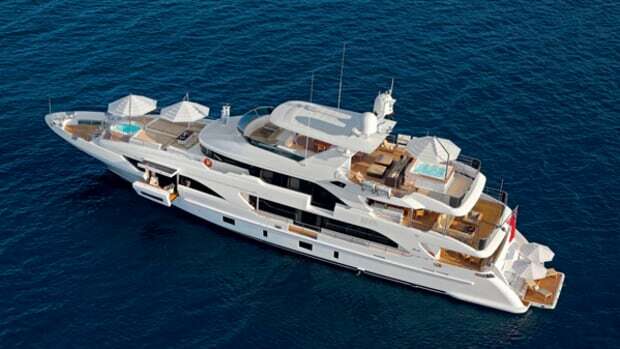 The space is sizable; this RP120 reportedly hosted 60 people on deck for a party. 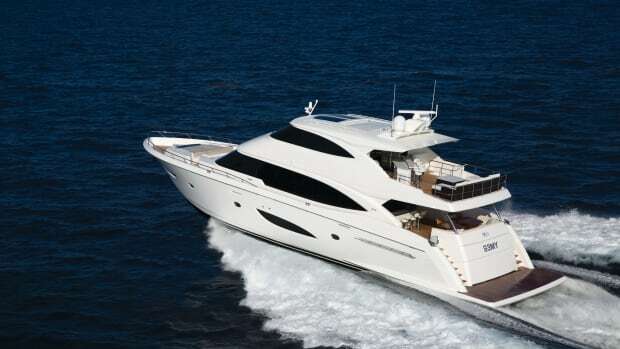 A hardtop with a built-in sunroof covers more than half of the flybridge, from the helm aft to the spa tub. Our test Horizon RP120 had the standard pair of 1,800-horsepower Cat C32 Acerts (top speed 19 knots). Owners can opt for twin 2,600-horsepower MTU V-16s. A pair of 65 kW Kohler gensets and a 75 kVA Atlas converter provide power, and ABT-Trac at-anchor stabilizers keep things level. 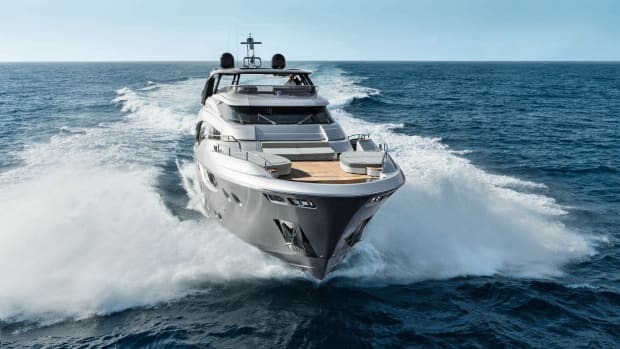 The engine room has walkways around each engine, systems racked for easy access and, in this yacht’s case, everything plumbed, wired and built to Bureau Veritas classification. 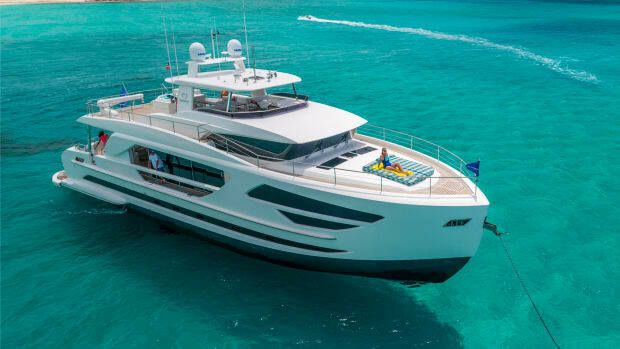 It’s always a pleasure for me to review a new Horizon because the shipyard raises the bar with each yacht. 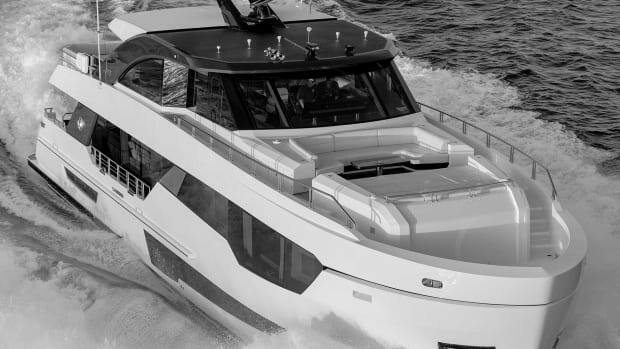 Newest and largest in the raised pilothouse series, the RP120 has been mobbed at recent boat shows, with good reason.